But have you ever tried to topically apply almond milk and use it as a skincare product? If not, you should try it our ASAP – almond milk has many benefits for your skin, plus it is super simple, easy and inexpensive to use it. First of all, almond milk benefits the skin by providing lots of moisture. It keeps your skin plump and well-hydrated. It contains vitamins B6, C and E, zinc, calcium, magnesium etc., all with numerous beauty benefits for you. Almond milk rejuvenates and refreshes the skin and keeps it soft and glowing. It is also full of antioxidants that prevent wrinkles and fine lines and protect our skin against free radicals. Almond milk gently cleanses the skin and makes it smooth and nourished. It naturally moisturizes dry skin and keeps dehydrated skin under control. Almond milk has skin lightening properties. You can use it to fade acne marks, aging spots and other skin discolorations. It soothes sensitive skin and helps you treat redness and skin irritations. You can use almond milk to help sun burned skin heal faster. All in all, almond milk can help you get a healthy, youthful skin, clear complexion and dewy glow. Of course, you can just use store-bought almond milk for skin care. However, making your own almond milk at home is so simple, fast and easy, you practically don’t have to put in any real effort. And the difference in quality is more than noticeable. 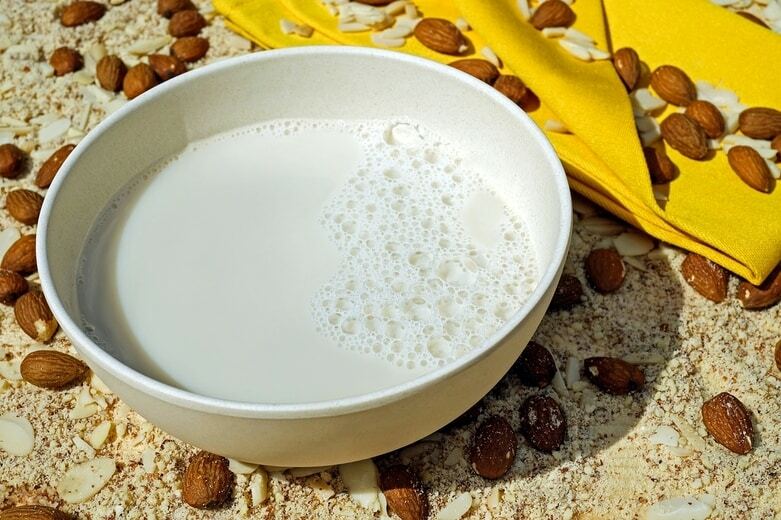 To make homemade almond milk, soak 1 cup of almonds in water overnight or even up to 24 hours. The next day, drain and rinse the almonds and peel their skins off. 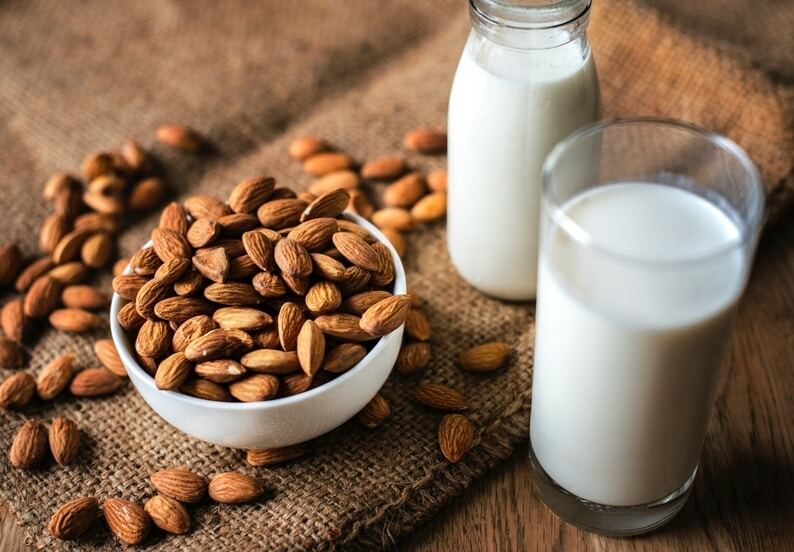 Put the almonds into a blender and add 2 – 3 cups of water (the more water you add, the thinner almond milk you get). Blend everything for about 2 minutes. Then, strain the almond milk out through a clean thin cloth. When making almond milk at home like this, it can only last for a few days in the refrigerator. So don’t make more than you can use in this time period. First mix the almond pulp and honey. Add a squeeze of lemon juice and any oil you like, that suits your skin (macadamia, olive, coconut, jojoba, sweet almond oil…). Mix everything well together. Wash your face using a gentle face cleanser and warm water. Apply the mask to a slightly damp skin and leave it on for around 20 minutes. Rinse the mask off well and apply your face cream right away, to lock in the moisture. You can use this almond pulp face mask once a week or every time you are making homemade almond milk, since it is always best to use the fresh almond pulp. If you prefer store-bought almond milk, or for some reason don’t want to use the almond pulp, there is this other DIY face mask that allows you to use the benefits of almond milk for skin quickly and easily. Both masks are suitable for all skin types, both nourish, moisturize and soothe your skin and both have healing, rejuvenating and restoring properties. First mix the almond milk, lavender oil and honey. If you want, you can warm up the honey a bit – it will be easier to mix everything. In the end, add enough of the oatmeal powder to get a smooth paste that is not too thick and not too runny. Apply the mask to a clean face, preferably after a face scrub. Leave it on for 15 – 20 minutes. Then rinse the mask off using lukewarm water. Apply a face moisturizer right away, to prevent the evaporation of water. Use this mask 1 – 2 times a week. You can use it every time you want to restore and refresh your skin, but it is especially helpful when your skin is dry, sensitive or irritated. Of course, one of the best ways to use all the benefits of almond milk for your skin is to use it as a hydrating & refreshing skin toner-treatment once a week. This amazing treatment will completely restore and replenish your skin, make it plump, supple and healthy, with the youthful appearance and dewy glow. When you want to use this almond milk toning treatment for your skin, pour 2 tablespoons of almond milk into a small bowl. Optionally, add some ingredient from the list above and mix well. Using cotton balls, apply the milk to your clean face. Wait for your skin to soak up the milk and reapply before it dries out completely. Repeat the process for 10 – 15 minutes. Then wash your face using lukewarm water. Apply a face cream suitable for your skin type while your skin is still slightly damp, to lock in the moisture. The best would be to also apply 2 – 3 drops of some facial oil over your face cream and massage it a bit into your skin. Repeat this almond milk skincare treatment once a week as a part of your nighttime skincare routine.